At the forefront of nozzle development, Delavan created its nozzle using bi-metal construction. The Brass body and stainless steel metering parts permit machining to close tolerances for precision and consistently high performance. Brass transmits heat fast from the nozzle face to reduce the possibility of varnish and oil residue buildup. Stainless steel provides that extra durability for metering parts where wear is a factor. Three basic nozzles that cover the widest range of oil burner requirements. Depend on the Delavan "Big Three" and their unmatched performance that maintains customer satisfaction at a high level. Delavan's three basic nozzles are the Type A Hollow, the Type B Solid Cone, and the Type W All Purpose Nozzle. The Del-O-Flo® uses a patented slot design consisting of very short slot length/depth ratio and substantially square slots to prevent plugging. These short slots keep the fluid from slowing and maintain turbulence, which keeps particles from collecting, settling, or clogging the nozzle. Delavan has developed a series of nozzles that will directly interchange with AR, R and SS type nozzles. 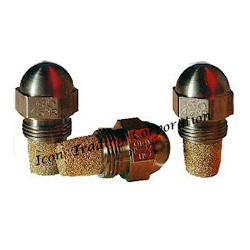 By supplying and trading superior quality Danfosss Burner Nozzles, we have earned huge acclamation in the market. These nozzles plays pivotal role in operation of industrial burners as our offered range is known for high functional efficiency and excellent finishing. We procure these nozzles from trusted vendors, who makes good use of modern manufacturing techniques, thus making them robust and accurate in dimensions. 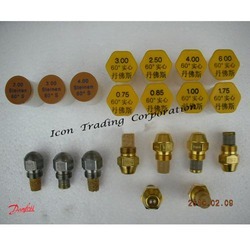 We are reckoned as precursor in supplying and trading premium quality range of Monarch Oil Burner Nozzles. Our offered nozzles are widely accepted in the market for their high performance and sturdiness traits. We procure these products from one of the most trusted vendors, who manufactures them by utilizing leading edge technology and best quality steel. 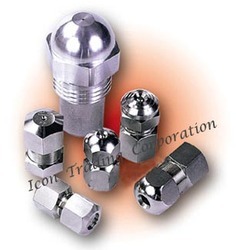 Highly corrosion resistant, these nozzles are available with us varied designs as per clients' requirements. 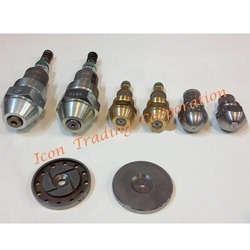 We are reputable entity instrumental in supplying and trading wide assortment of Weishaupt Burner Nozzles. These nozzles are well reckoned among our customers for their exceptional functionality and superb finishing, hence have wide use in various burning processes for fuel injection. Owing to their procurement being done from trusted vendors, these nozzles are made in compliance with strict industrial norms under various specifications. With the firm devotion in supplying and trading Thermax Boiler Oil Nozzle, we have attained wide reputation as forerunner in this field. Excessively used in industrial burning processes, these burners possess great spring action mechanism with precise accuracy and finishing. We procure these products from notable vendors, who makes perfect mix of quality tested materials and advanced technology in manufacturing these products in various specifications. 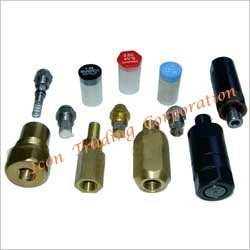 We supply bentone oil burner nozzle which are we importing directly from Nozzle Manufacturers Monarch and Danfoss. Various Capacities & Spray Angles Oil Nozzles are available for following different bentone burner which we stock and supply all over world. We are leading Manufacturer,Supplier and Exporter of Industrial Equipments & Furnaces like For Steam/Thermopack Boiler, Solid fire/Oil Fire/Gas Fire. Oil Pump, Boiler Spare & Parts, Industrial Laundry Equipment, Chimney,Tumbler, Flatwork Ironer, Oil & Gas Burner,Suntec Oil Burner Pump, Water Softener, Ion exchange Resin,Pipe Line Fabrication & Erection. across the Eastern India mainly Kolkata,West Bengal,Nepal, Bihar, Jharkhand, Orissa, Assam, Siliguri, Durgapur, Asansol, Ranchi, Dhanbad & Bhutan region. Looking for Oil Burner Nozzels ?